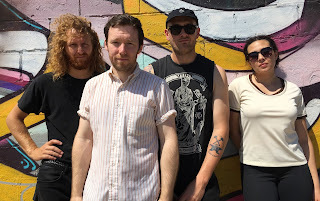 If It's Too Loud...: American Wrestlers - "Give Up"
When I first saw there was a band called American Wrestlers on Fat Possum Records, I instantly knew what they sounded like. It was going to be dirty, bluesy punk, obviously. Apparently I'm old (and we missed their debut album from last year), since that doesn't appear to be Fat Possum's thing anymore. "Give Up," the new song from American Wrestlers, is upbeat and poppy as can be. American Wrestlers was started by Gary McClure after moving from Scotland to St. Louis, MO of all places. The song stops just a few steps away from being twee, and are on the more rockin' side of what is now called dream pop. American Wrestlers' second album, Goodbye Terrible Youth, is due out November 4 on Fat Possum Records. You can pre-order it here. For more information on American Wrestlers, check them out on Facebook and Twitter. You can listen to "Give Up" below.